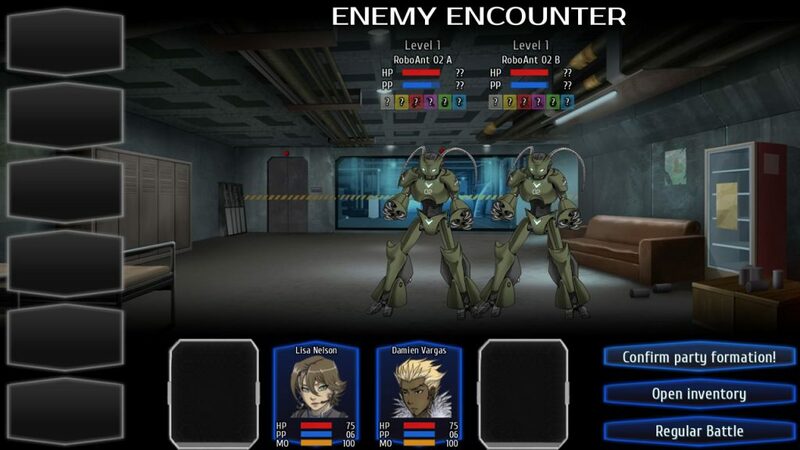 In the screenshot above: like the old times, fighting malfunctioning Roboant in the tutorial battle! Time for an update on the RPG I’m currently working on (personally, I have other writers working on other games right now, like Volleyball Heaven and other “secret stuff”). It’s slightly outdated since I’ve changed a few things on my side already, but of course if you find more bugs or have suggestions feel free to let me know. I think in general the RPG part of the game it’s at good point, of course I’ll do a lot of tweaks and updates like I did for my past RPGs during beta, however the base/core system is there. Now my goal is to get the isometric map working so that I can playtest myself all the missions (and side-missions) of the whole first chapter. while the RPG part of this game is complex, I’d say that the plot part is not easy either! So I am first planning everything before I jump into writing scenes that maybe I have to discard later on, because I didn’t consider this path or this variable or this plot hole and so on. Maybe it doesn’t seem, and you probably won’t even notice while playing the final game, but it can be really complex and drive you nuts, believe me! Once I have the first draft of the plot finished I’ll then start scripting the game and at the same time also code the various battles and quests, and probably add a few more along the way since I always get an inspiration to write new sidequests as I code the main game. My goal is also to have personal quests for each character, since it’s also a classic of RPG (and almost all my RPGs had this personal quest feature). This entry was posted in beta demo, development screenshot, general, planet stronghold 2, roleplay games. Bookmark the permalink.